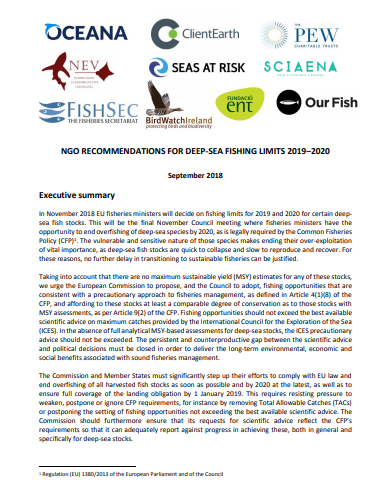 In November 2018 EU fisheries ministers will decide on fishing limits for 2019 and 2020 for certain deepsea fish stocks. This will be the final November Council meeting where fisheries ministers have the opportunity to end overfishing of deep-sea species by 2020, as is legally required by the Common Fisheries Policy (CFP)1 . The vulnerable and sensitive nature of those species makes ending their over-exploitation of vital importance, as deep-sea fish stocks are quick to collapse and slow to reproduce and recover. For these reasons, no further delay in transitioning to sustainable fisheries can be justified. Taking into account that there are no maximum sustainable yield (MSY) estimates for any of these stocks, we urge the European Commission to propose, and the Council to adopt, fishing opportunities that are consistent with a precautionary approach to fisheries management, as defined in Article 4(1)(8) of the CFP, and affording to these stocks at least a comparable degree of conservation as to those stocks with MSY assessments, as per Article 9(2) of the CFP. Fishing opportunitiesshould not exceed the best available scientific advice on maximum catches provided by the International Council for the Exploration of the Sea (ICES). In the absence of full analytical MSY-based assessments for deep-sea stocks, the ICES precautionary advice should not be exceeded. The persistent and counterproductive gap between the scientific advice and political decisions must be closed in order to deliver the long-term environmental, economic and social benefits associated with sound fisheries management. The Commission and Member States must significantly step up their efforts to comply with EU law and end overfishing of all harvested fish stocks as soon as possible and by 2020 at the latest, as well as to ensure full coverage of the landing obligation by 1 January 2019. This requires resisting pressure to weaken, postpone or ignore CFP requirements, for instance by removing Total Allowable Catches (TACs) or postponing the setting of fishing opportunities not exceeding the best available scientific advice. The Commission should furthermore ensure that its requests for scientific advice reflect the CFP’s requirements so that it can adequately report against progress in achieving these, both in general and specifically for deep-sea stocks.